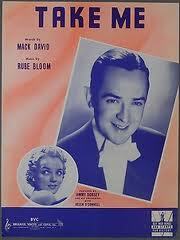 “Take Me” was popular when it was first released, with recordings by Tommy Dorsey, Jimmy Dorsey and Benny Goodman. “Take Me” was recorded on September 4, 1952 and released as single that year. It was arranged by Percy Faith.